A mediated settlement and Maduro stepping down benefits whom Mr. Feffer? The poor will be at the mercy of the Venezuelan elites and the likes of S. Florida criminals backing Sen. Rubio. 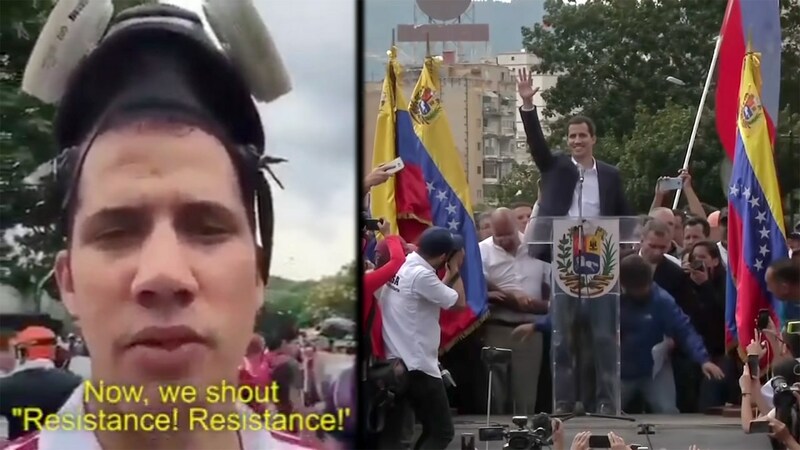 The backers of Guadio will crush and repress the Chavistas, extralegal murders by the thousands from Elliot Abrams and the Trump Adm. will follow. This re-run we’ve seen dozens of times before, too, Mr. Feffer. I care less about Maduro and his cronies than the activists who’ve raised a generation of children to believe in something other than " the kindness of strangers with high-tech weapons and bad intentions ". Before Maduro? There was oil. And sanctions. And the Marshall Plan. Mr. Feffer, you are full of it. This site runs on donations, like our Congress. Still has mostly free speech, though. At least you can post. Most sites, you cant post. Those who get thrown out here for their opinions, have been some, but few. Back decades ago, my town newspaper columnist reported that the WH would make a call to the paper whenever they became uncomfortable with some print. I get the feeling this site expects the comments to come up with real news. Well, yeah, absolutely, and they’ve really been intervening in Venezuela, various US administrations, since at least the early 2000s, when we know that the US government—through institutions like the National Endowment for Democracy—has been providing funding and training to opposition groups in Venezuela, and often very hard-line groups that have taken a radical line, not recognizing the government and trying to seek its removal through extra-constitutional means, including a short-lived coup that took place in April of 2002. The Nobel prize-winning Carter Center noted that Capriles “competed” on the “cowed” private media by receiving nearly three times as much coverage, the large majority of it positive and Maduro’s coverage negative, except on state media, which accounts for a tiny percentage of the market. It also noted that twice as many people reported feeling pressured to vote for Capriles than Maduro. The Carter Center’s founder Jimmy Carter described Venezuela’s elections as “the best in the world”. In reality, Capriles enjoyed enormous advantages; the Capriles family controls Cadena Capriles, one of the largest media empires in the country. Furthermore, he enjoyed the committed backing of the US state department. David and Goliath indeed. Despite some articles of dubious journalistic integrity, Common Dreams is one of the few organizations I consistently donate to. This article is has planted serious doubt in my future contributions. Readers on this site deserve better than this. For those interested in fact based research and reporting of the mess in Venezuela, this article is enlightening. President of Venezuela Maduro was elected; just because the opposition chose to boycott the election does not make him less elected. He already gave up a year of his term to hold early elections which in my mind indicates a willingness to be cooperative. The question should be: how would he have been able to govern if there were no illegal US sanctions placed on the country? and no US Saudi Arabia oil price manipulations? But then no country on this planet is safe from the US corporations and government when it comes to stealing resources. For the record, this US citizen recognizes President Maduro as the elected by the people president of Venezuela. WOW, propaganda disguised (i suppose) as common dreaming? no 2002 coup, no smashing of the economy, no mention of what the elites will do if they get power? who is this guy and why is he allowed to do this on this site? where r the editors? is this the view of common dreams? we don’t need to plant trees, there’s plenty of oxygen going to waste here. i hope i fail your community guidelines for this and get thrown out -save me from reading crap like this. which one is the israeli hard right site? I am not sure why CommonDreams would publish an opinion that I could easily find in any other mainstream outlet like the pro-war Washington Post, NYT, CNN, MSNBC, BBC, etc. etc. John Feffer is clearly playing two sides to advance the US policy of regime change, utilized in Irak, Syria, Lybia, etc.